The Best Planner for Law School + Free Promo Code! Law school makes life rather busy. I relied heavily on my planner during my first year to keep myself organized and in control. I kept track of homework, reading, meetings, things to do, cleaning and meal planning all within my planner. I am pretty obsessive about my planner and I color code everything. It keeps me happy to open my planner and find it pretty and organized. I did a lot of research into high-end planners in my quest for the perfect one. My senior year of undergrad I splurged on the famous Lilly Pulitzer Planner. Though beautiful, it just did not suit my needs and I ended up ditching it for a little leather planner I found at T.J. Maxx for $5. That planner also was not perfect by any means but it got me through graduation. In preparation for law school, I started researching again. I gave Bullet journaling a try as it is the craze of Tumblr but I just really couldn't make it work for me. It was just too much work and I gave up before it really helped me. This time around I came across the Erin Condren Life Planner which seemed to be great for juggling many things but the sticker price was a bit steep. 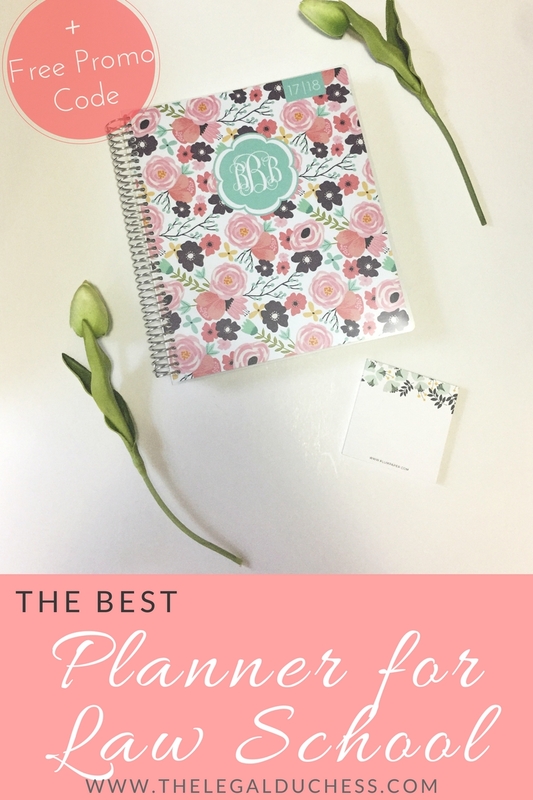 When searching for the perfect planner that was not quite the price of the EC planner, I came across many great reviews for the Plum Perfect Planner. I ordered it on a whim and I have never looked back! It is seriously the perfect planner. The company is small and has absolutely excellent customer service. It is pretty, functional, customizable and holds up to use and abuse which makes it worth every penny in my book! I recently reordered my second planner because I simply cannot survive without it. Here is my reasons for why the Plum Paper Planner is simply the best for law school... actually it's just the best in general. I wanted a planner with plenty of space to write, extras and lots of pretty. This fits the bill in every way. The planners are gorgeous- you pick a custom cover and you can get your name, a picture or a monogram on the cover. I chose a monogram for mine along with this pretty floral pattern. There is a tough clear cover over that to keep your pretty cover protected. It is all bound with a strong metal coil which does not come undone (unlike other planners I have had in the past). They also included this cute little note pad which was so sweet! The inside is made exactly how you choose: you have three different options for the weekly layout. Last year I had the morning/afternoon/evening vertical layout and it worked great. This year I chose the horizontal daily layout for a little more space to write my assignments down. Either is great. There is always a little note section per weekly layout for any extra notes or to-do lists (I am a big fan of lists). The interior of the planner includes a monthly planning page where you can lay out goals and important dates. There is also a full month layout for when you need to see the whole thing in perspective. I also love the little extras like the password page- I can never keep all my passwords straight and this is a lifesaver for me. There is a contacts page which is good for all the new friends in law school and also some blank pages for when you need to jot something down and a little pocket for collecting any little papers. Plum Paper offers tons of amazing add on's to your planner to make it exactly what you want/need. In my first planner, I got the monthly to-do lists and the blog planner. This years planner I got the to-do lists again plus a meal planning section. There are options like fitness trackers, cleaning schedules... pretty much something for everyone. I always hated buying a new planner and having to automatically skip past a few months that have already passed and I no longer need. It just seems like a waste. Plum Paper will start you planner exactly when you need- simply pick a month and it starts there. You can choose the length. I like the 12 months because I feel like any more would be too big. The planner is convenient. It is a nice size that fits well in a bookbag or purse. It is sturdy and holds up to lots of wear and tear. It will not be confused with anyone else because it is customized. It is made to fit you and be convenient for your life to keep you organized. There is nothing better or more convenient than getting to choose exactly what you need. The planners are a little pricey ($32 before add on's) compared to the store bought variety but when you consider everything you get for the cost, it is a great deal. I will pay a little extra for the custom planner that is exactly what I need for my life. The folks over at Plum Paper have been kind enough to extend a 10% off promo code to my followers for their planner purchase. If you want $10 off your Plum Paper Planner purchase- drop me an email using the contact form at the bottom of my blog stating you want the Plum Paper referral code and I will send you an email with the referral code for $10 off. There is no way around it, I think this is simply the best planner on the market. I don't think I will ever order another. This is my year old planner... off to a well-deserved retirement. It served me well! On to new beginnings with this pretty little coral thing to start off 2L year. Hi, how long did it take you to receive your planner after ordering? 2 weeks I think? Not long for a custom item! Thanks for the detailed review. It is hard to know if a planner is nice when you can't actually hold it in your hand while choosing. I'd love a promo code! Can you send me a referral code? I'd love to try one out this year!